The classic DC Comics storyline "The Death of Superman" comprises three distinct chapters: Doomsday!, Funeral for a Friend, and Reign of the Supermen. All three are great, among the best DC has ever published and they were a massive hit that comprised more than a year's worth of stories into 1993. 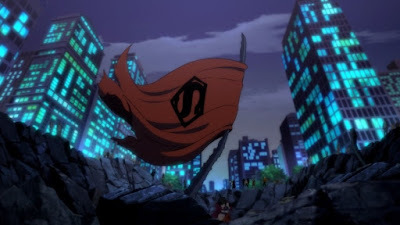 There have been numerous adaptations of it in various forms, even some of it was used as part of Batman v Superman: Dawn of Justice in the fight against Doomsday, but we're only now getting a complete version with the animated film, The Death of Superman. Featuring the voices of Jerry O'Connell as Superman, Rosario Dawson as Wonder Woman, Nathan Fillion as Green Lantern, Rainn Wilson as Lex Luthor, and Jason O'Mara as Batman, the movie depicts Superman's fatal clash against the unstoppable creature known as Doomsday. In the comics Doomsday shreds through all of Earth's heroes before it comes down Superman as the only one who can stand up against the threat. A sequel, titled Reign of the Supermen, will be released in 2019 and will show how the world mourns Superman's death. It should also feature the emergence of four heroes inspired by Superman's sacrifice. The Death of Superman hits digital release on July 24th, following by Blu-Ray/DVD on August 7th.